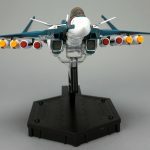 The braces for the fighter mode display stand adapter can be moved into an upper position for standard fighter mode and a lower configuration for when the advanced packs are installed but the difference wasn’t significant. 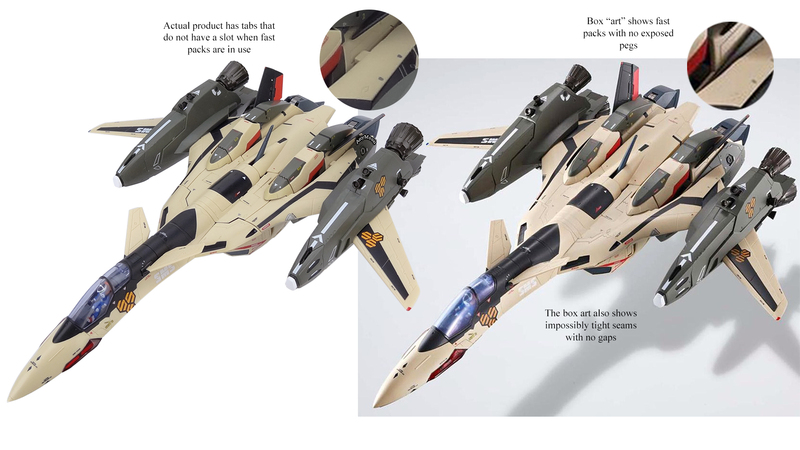 How is this better than the Arcadia YF-19 toy? 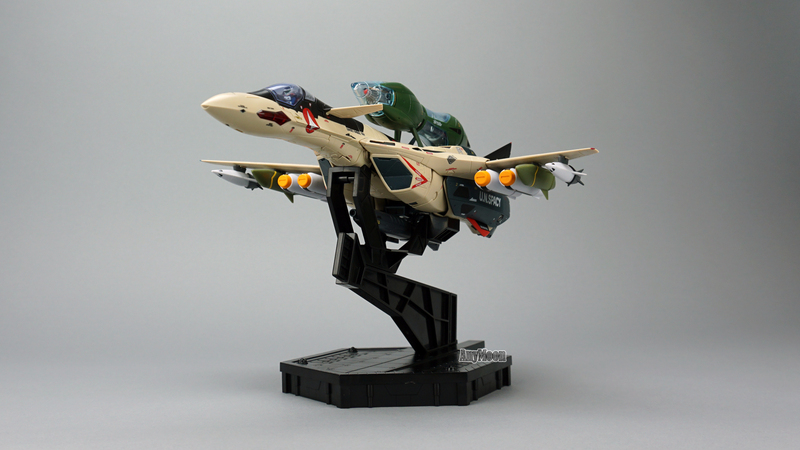 You get a display stand, albeit a mediocre one. 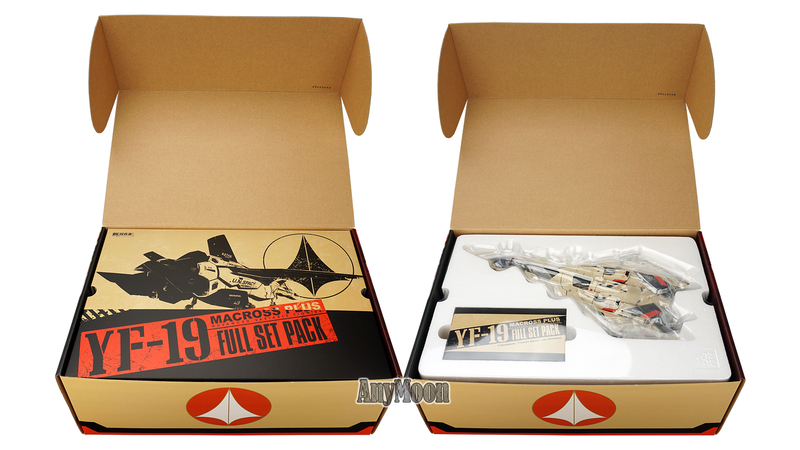 You don’t get stickers (you don’t need them) or leg cavity fillers (you won’t miss them). 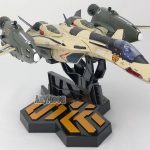 How is it worse than the Arcadia offering? 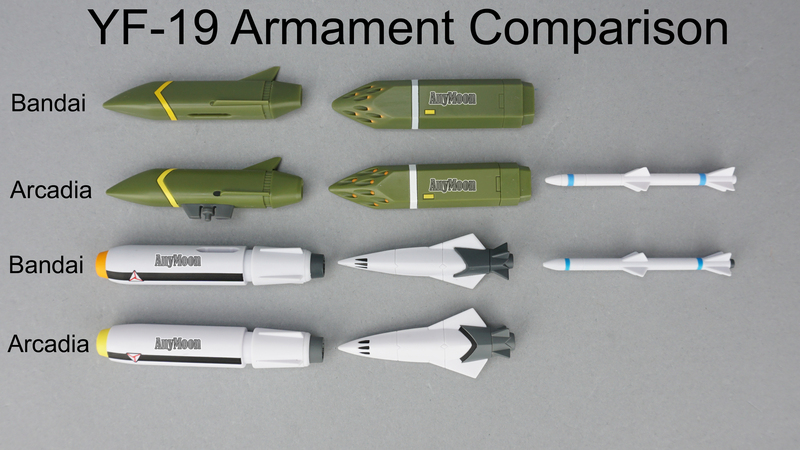 Arcadia gave you more wing armaments than you would ever be able to utilize whereas Bandai doesn’t give you a single missile of payload. 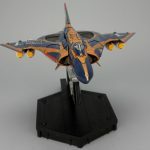 Arcadia also gave you Yang and an additional Isamu pilot figure and packaged the whole thing in an uglier box that DID offer MIB collectors the ability to see what they owned without cutting any tape. 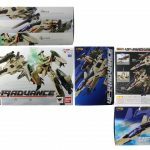 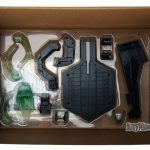 With the Arcadia toy you were overwhelmed at all the options you had, with the Bandai toy you’ll quickly be a little put off by the sheer volume of parts needed for the display stand and the advance packs. 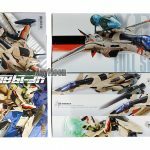 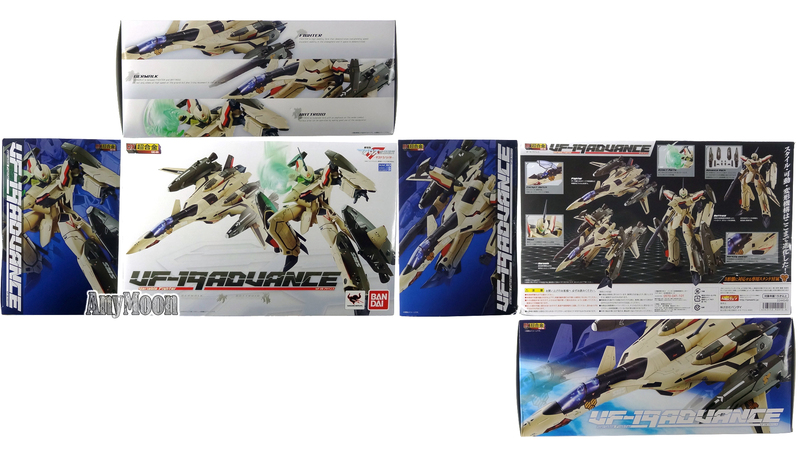 Advance packs are the Macross Plus fast packs plus the additional top of shoulder parts (2x each arm) and wing boosters. 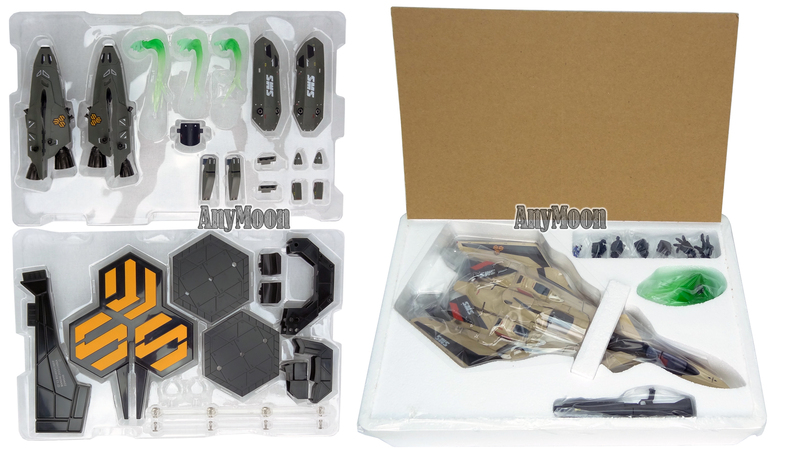 Items in blue represent accessories only included in one release. 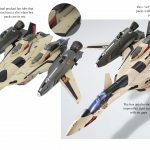 Another way I could have written the YF-19 parts list would have been “it’s everything that Arcadia included plus a fold drive, display stand, heavy arm cannon, fixed posed hands, and pinpoint barrier punch, but without the stickers because all the details are already painted on the toy and without leg cavity fillers but you won’t miss those.” The one thing that is obviously missing is the a cover for the rear seat to make the YF-19 appear a single seat vehicle like it does for the first half of Macross Plus. 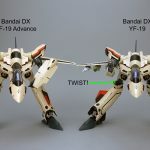 The display stand included with the YF-19 has the generic base that Bandai has included with numerous other releases rather than the ‘SMS’ base that comes with the VF-19Advance and a wider fighter mode cradle to accommodate attachment of the heavy arm cannon. 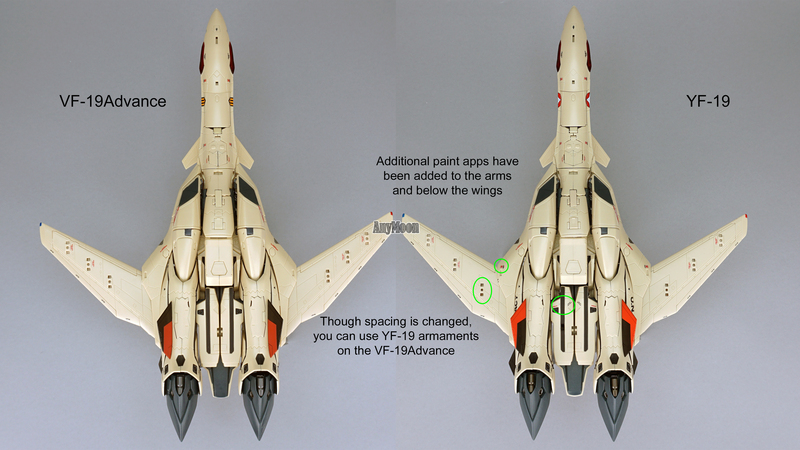 As the VF-19Advance was the first release, many people purchased it and used it as a YF-19 replacement. 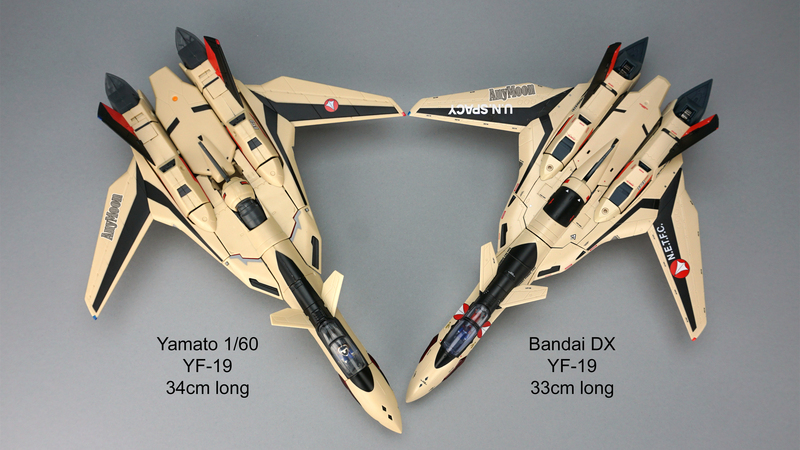 The subsequent release of a proper DX YF-19 is surprisingly different despite being 95% the same mold. 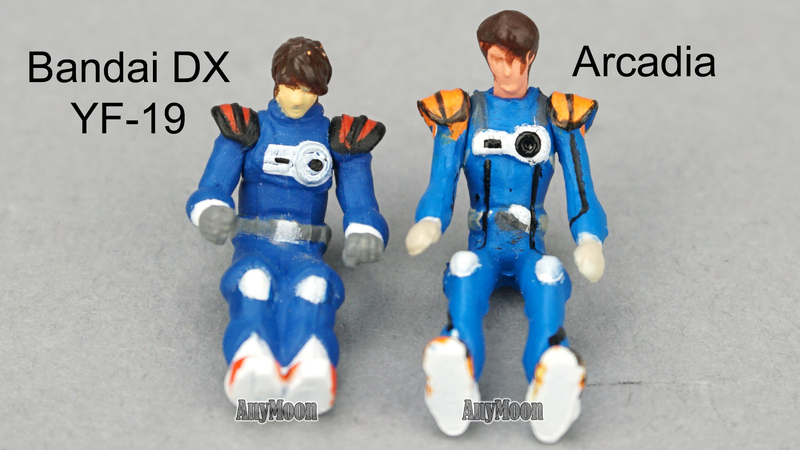 There are two notable changes to the mold. 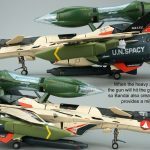 First, the VF-19Advance has a true one seat cockpit that can not be converted to two seats and has a one piece canopy that opens like a traditional fighter jet. 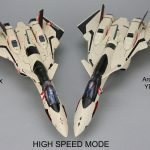 The DX YF-19 has a dedicated two-seat cockpit and two piece canopy that opens forward and back with a split in the middle. 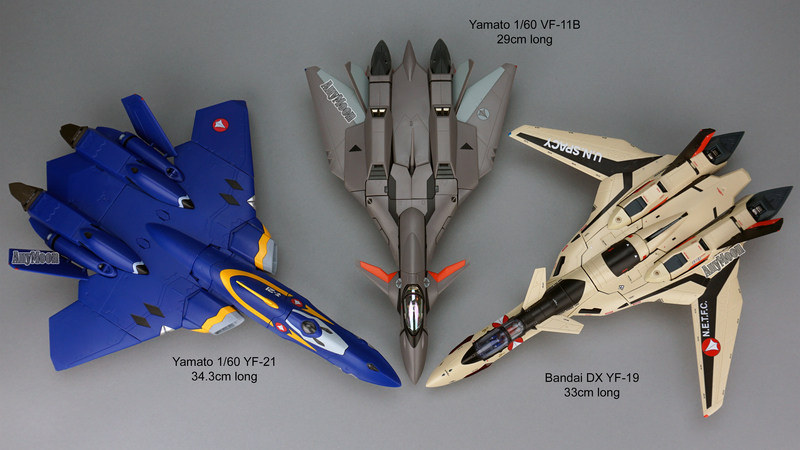 Second, the YF-19 has very different heels. 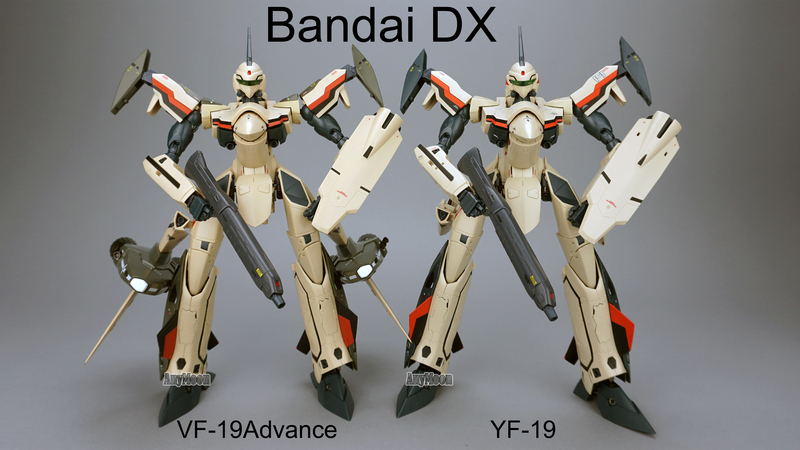 The 19Advance has long sleek heels which look great in fighter and pretty long in battroid. 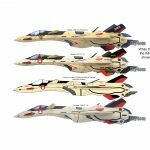 The YF-19 has very stubby heels which are definitely more anime accurate to Macross Plus but look a little clunky in fighter mode while looking good in battroid. 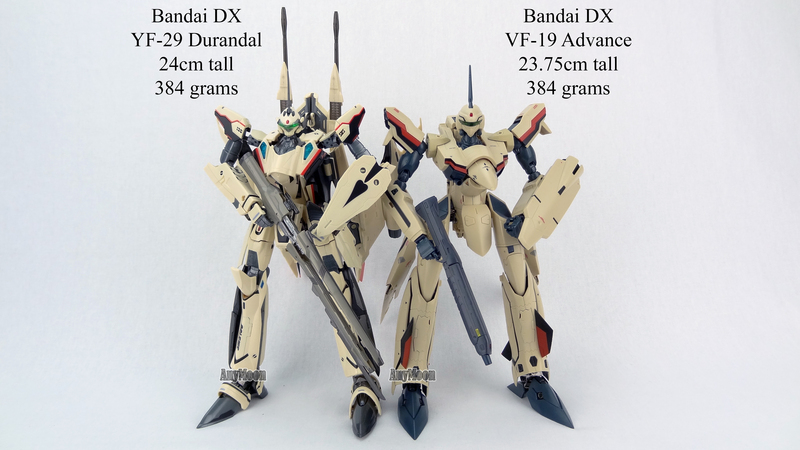 The most obvious visual difference between the two toys are the various painted details. 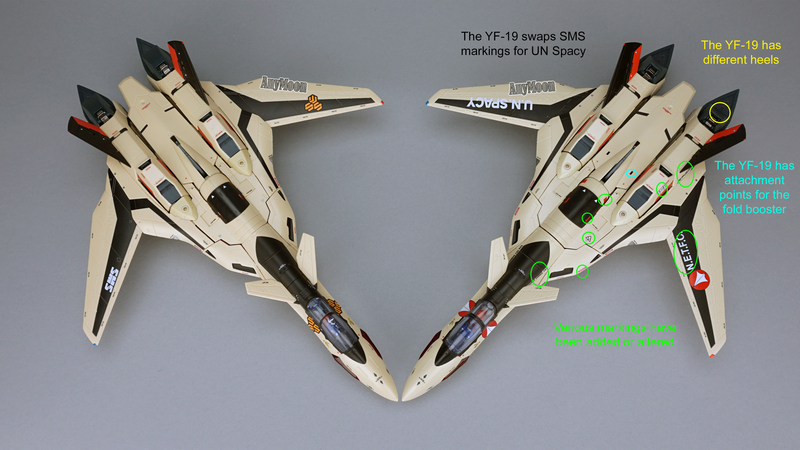 Some were obvious, the 19Advance has markings related to SMS while the YF-19 has UN Spacy logos. 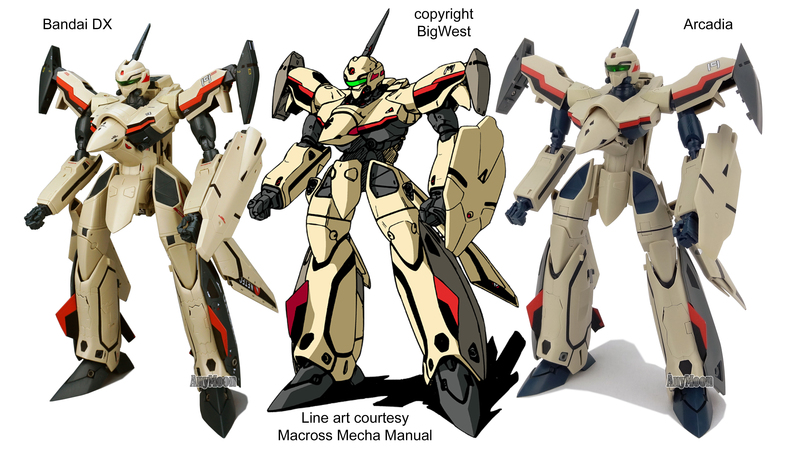 Some of the other differences are a bit more surprising. 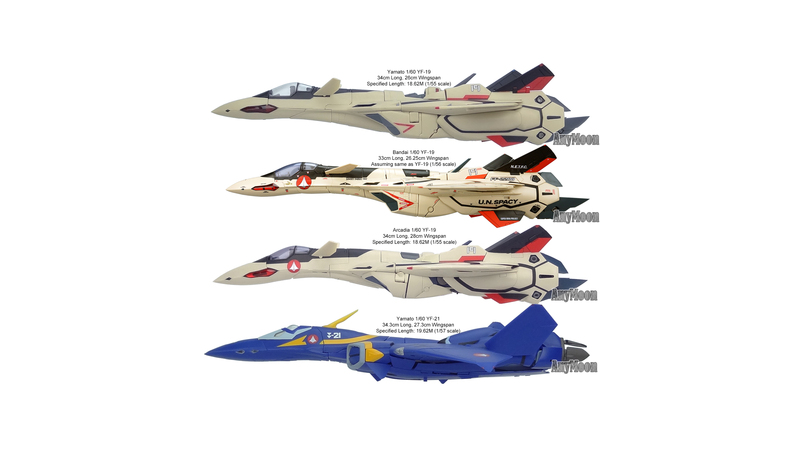 There are emblems and writing related to “Sinsei Industry”, the in-universe company that created the YF-19 (usually written as “Shinsei”). 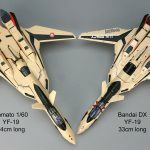 There were already a huge number of painted on warning signs but it looks like someone at Bandai studied their 19Advance for a long time and realized the markings weren’t totally consistent and had some more added for the YF-19 (like on the arms and part above the intake). 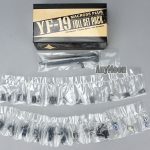 The gun on the YF-19 also has the model type painted on. 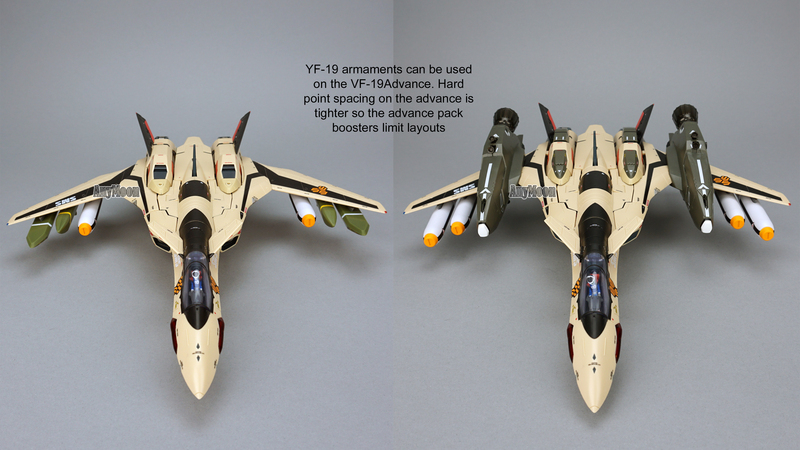 The shield on the YF-19 also has two little slots in it to accommodate the fold booster gimmick. 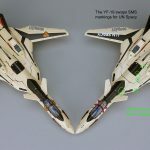 The arm on the YF-19 has mounting slots for the arm cannon that are not present on the 19Advance. 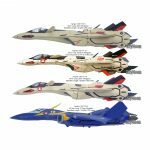 It will be interesting to see if the VF-19Advance ever gets reissued, and, if it does, if it includes those slots. 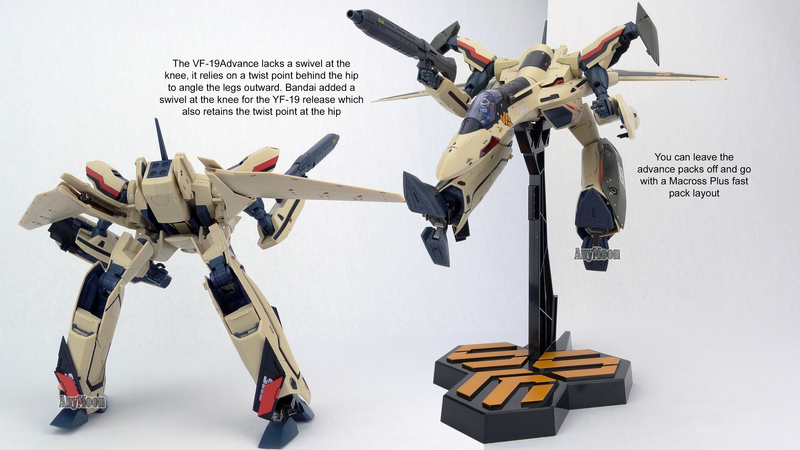 Overall, the YF-19 is also a tiny bit lighter beige than the VF-19Advance. 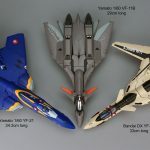 There are a few areas where this toy bests the Arcadia YF-19. 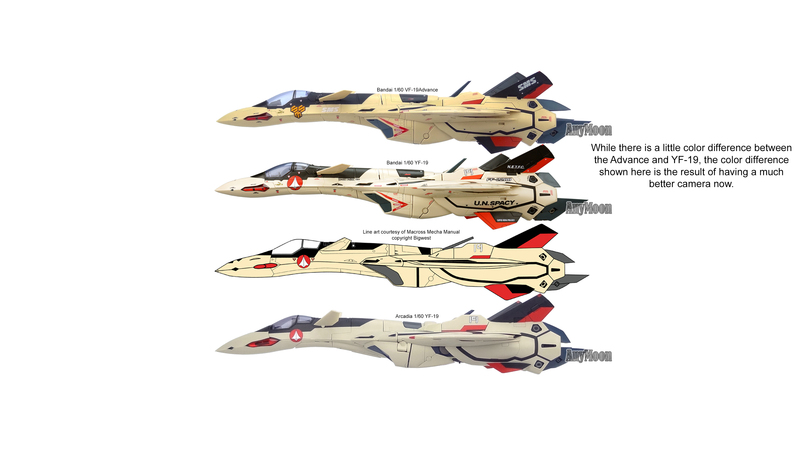 First, it gets the intake shape right and eliminates the fat leading edge above the intake in fighter mode. 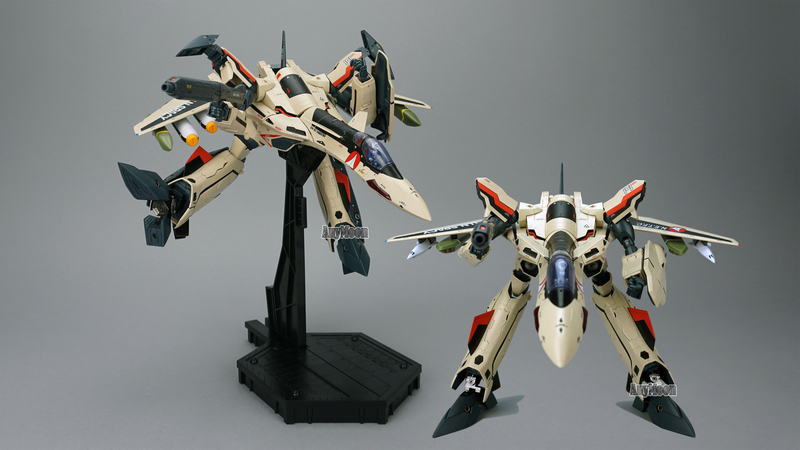 Second, you don’t need to extend the legs in fighter mode to reveal the black area that shouldn’t be there. 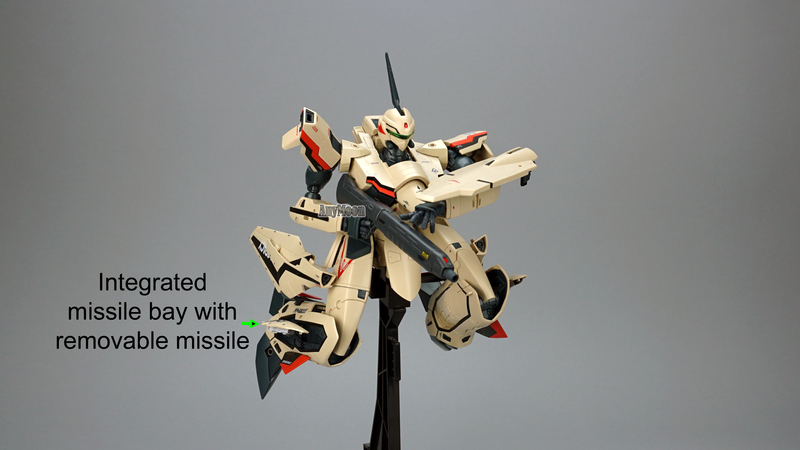 Third, the fins below the legs are a better size. 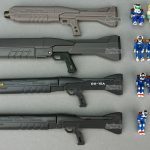 Fourth, the canards are a better size and they have a better rotation system that doesn’t rely on an obvious peg (though some wish the canards could be angled higher). 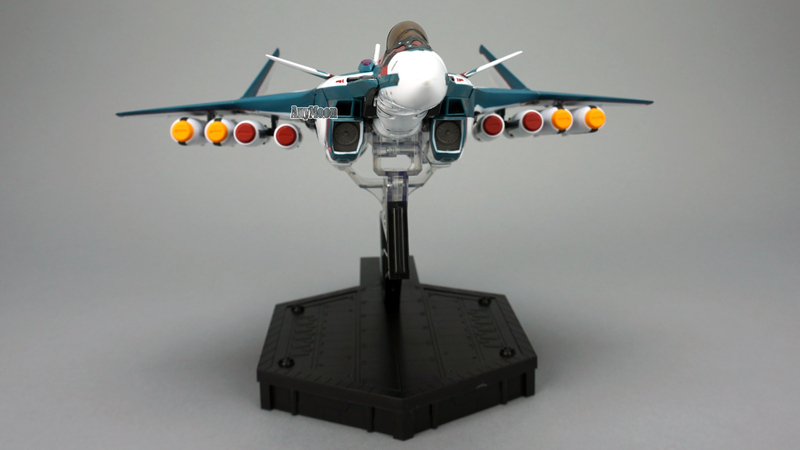 When viewing fighter mode from the side the Bandai is a clear winner. 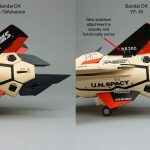 However, if you view both toys in fighter mode from above the Arcadia shield fills the gap between the legs better than the Bandai offering. 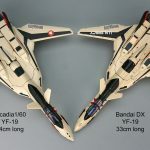 Arcadia also nails the curves of the neck in fighter mode; Bandai reduced these curves which does give Bandai an edge in not having to have the big gap above the nose in battroid mode. 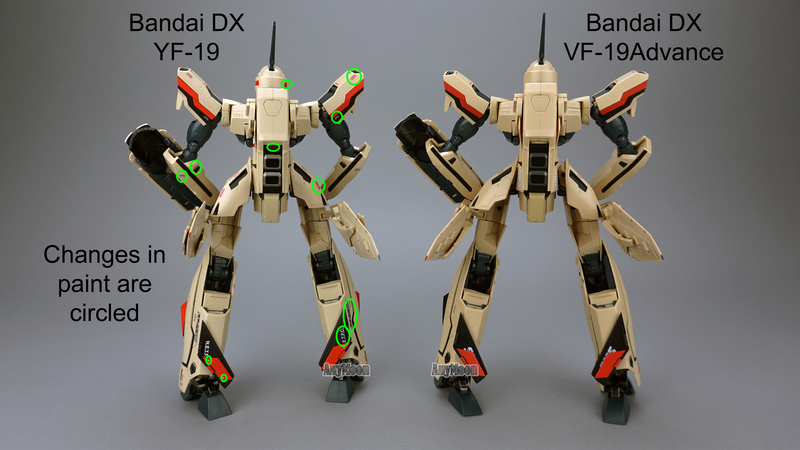 When it comes to painted on detail, the Bandai trounces the Arcadia offering. 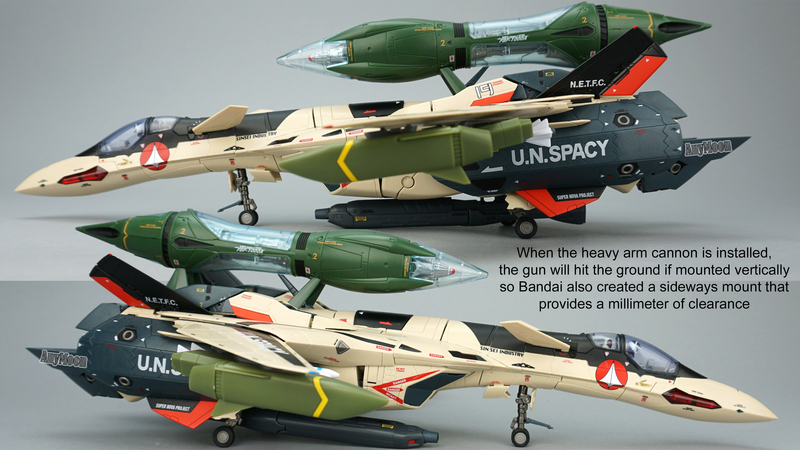 Some may even feel that Bandai got a little carried away with the painted on markings. 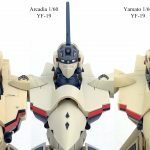 “Pleasantly Chunky” is a very good way to describe the Arcadia YF-19’s battroid mode. 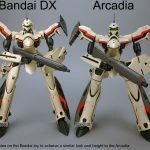 The Bandai toys do have an excellent battroid mode that is thinner and perhaps more athletic looking but I feel the Arcadia battroid captures the animation spirit better. 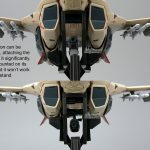 As usual, Bandai’s landing gear, while metal with rubber spinning wheels, don’t compete with the painted look of Arcadia’s gear and gear bays. 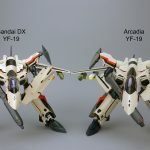 Taking the comparison to the Arcadia toy a bit further, the included weapons in both companies YF-19 sets are VERY similar. 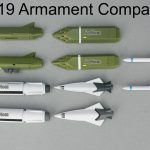 The Bandai toy does benefit from a tiny additional paint application on the rear of the AOM-85 mid-range missile and Arcadia added a little more paint to their HMM-111CS weapons. 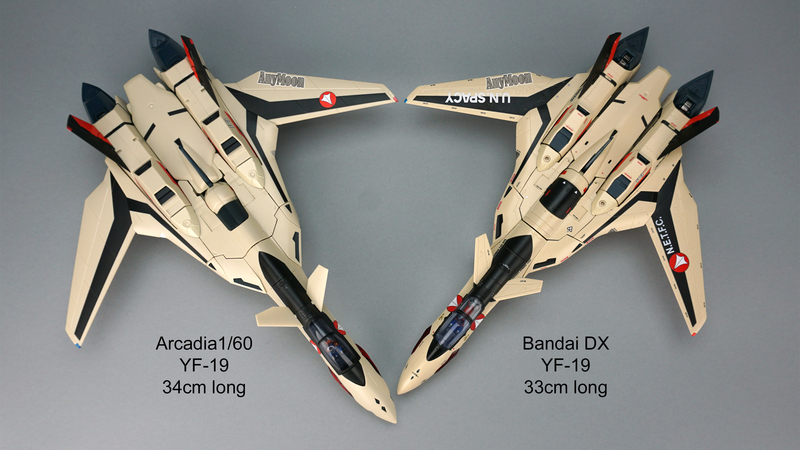 Arcadia made their toy compatible with the Yamato YF-19 fold booster. 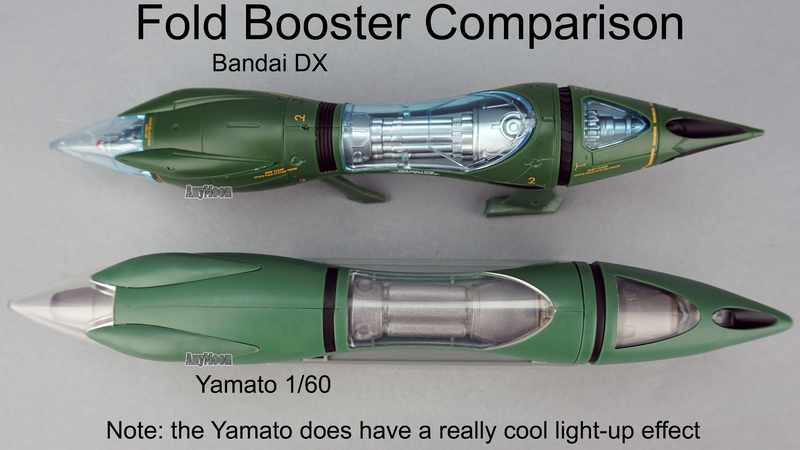 Though the Bandai fold booster does not have the super cool LED effect Yamato employed, the look of the Bandai booster is much more impressive from the panel lines to the interior detail to all the paint applications. 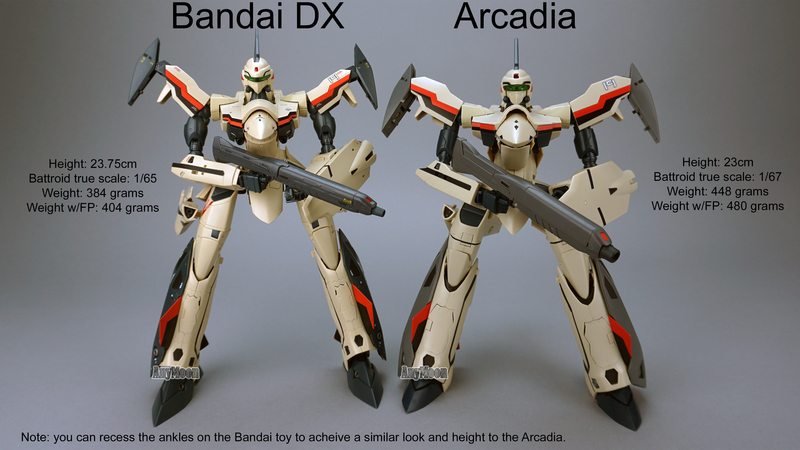 While the pilot figure is a step up from previous Bandai offerings, it still falls short of the Arcadia figures. 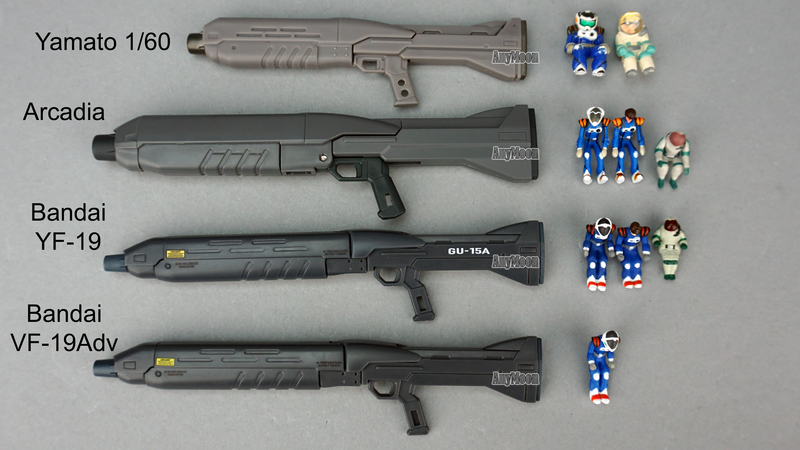 The Arcadia gun is also far bulkier and much more pleasant to my eye. 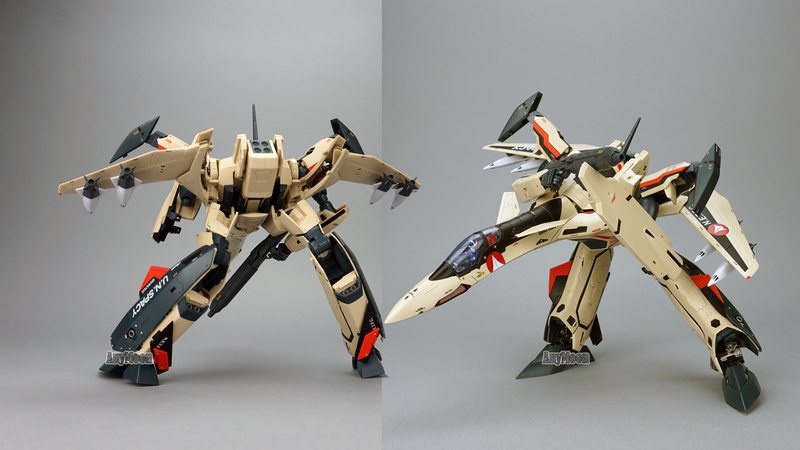 These are welcome gimmicks in that they make the toy have a more perfect transformation. 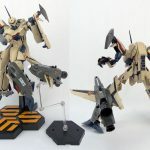 You will only need a neck cover in Gerwalk mode. 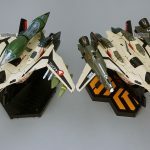 While a lot of thought clearly went into both the Bandai and Arcadia toys, I ultimately scored the Bandai higher because the Arcadia is better on paper than it is in your hands. 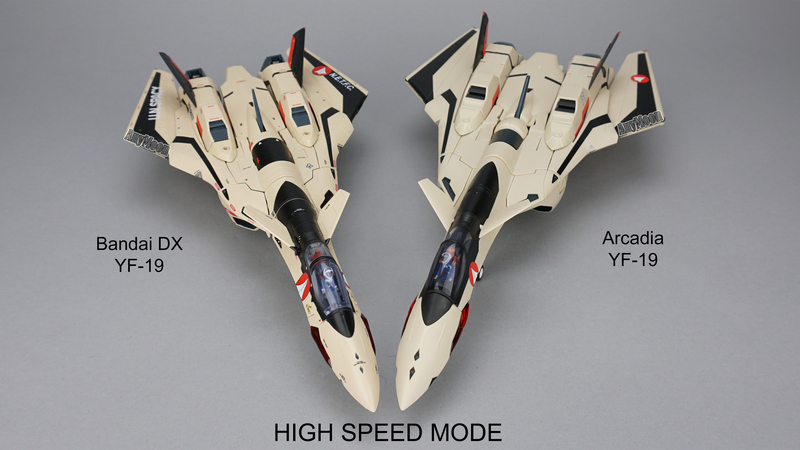 This is particularly true of the high speed mode wings. 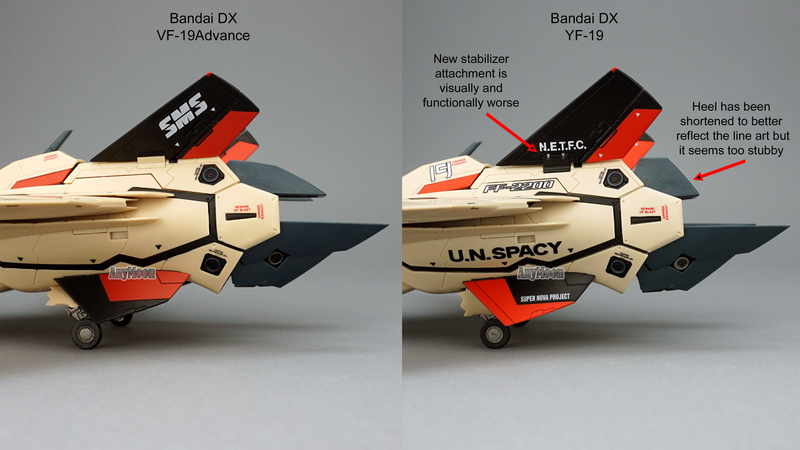 The wings are stiff enough on the Bandai toy where you won’t constantly be cursing them. 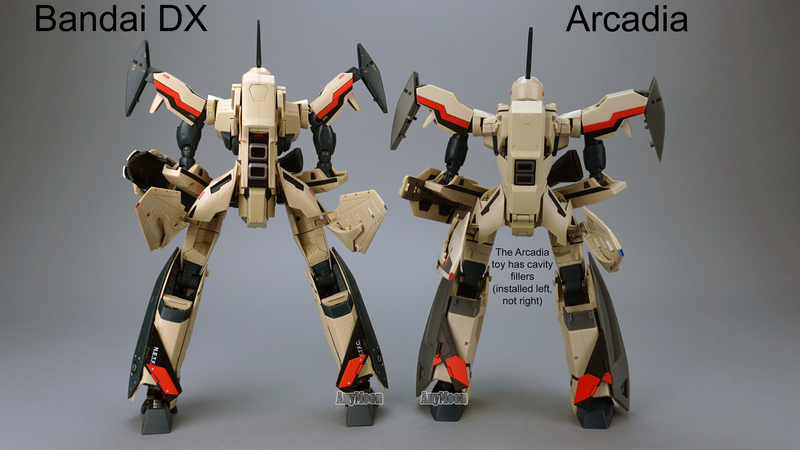 On the Arcadia toy the wings are so loose they will destroy your enjoyment of handling it. 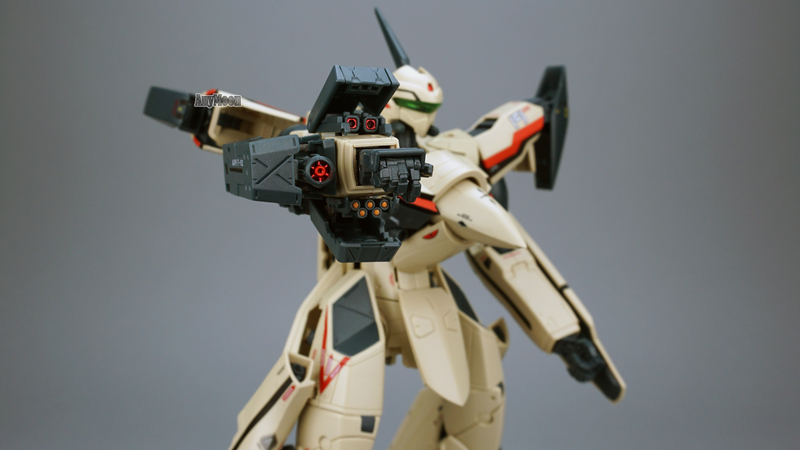 The DX YF-19 upped the ante by including a heavy cannon accessory for the right arm. 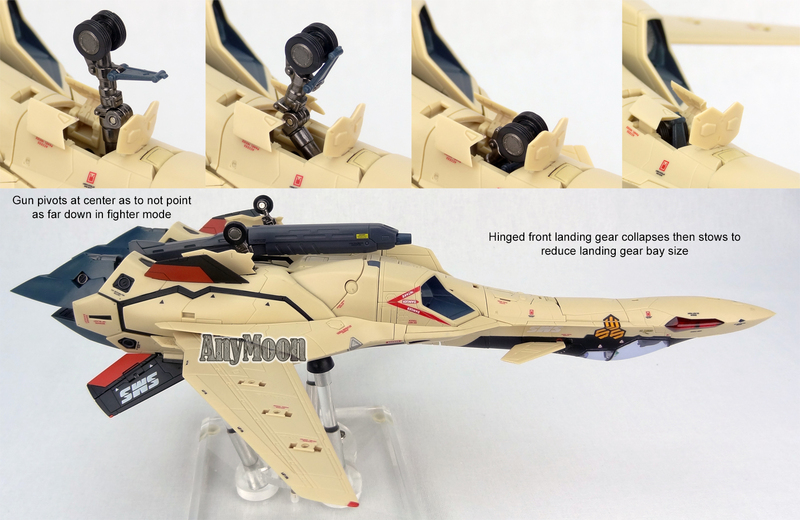 I found it very impressive that this accessory also transforms so that it can be used in fighter mode. 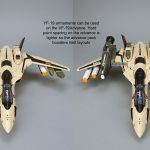 The fighter mode implementation isn’t perfect as the extra height of the cannon moves the gun so low that it interferes with the landing gear. 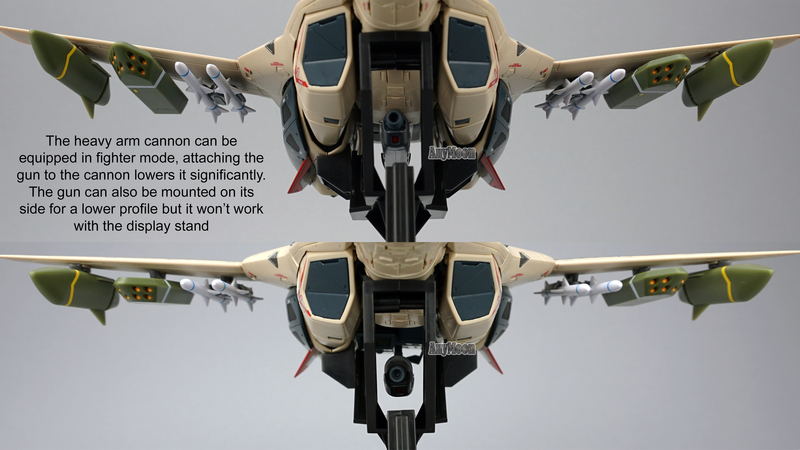 To counter this, Bandai gave you the option to mount the gun sideways but even that allows only the tiniest amount of clearance (if any). 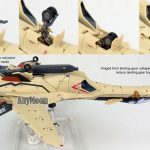 I definitely recommend using the display stand if using the arm cannon in fighter mode and then mounting the gun vertically. 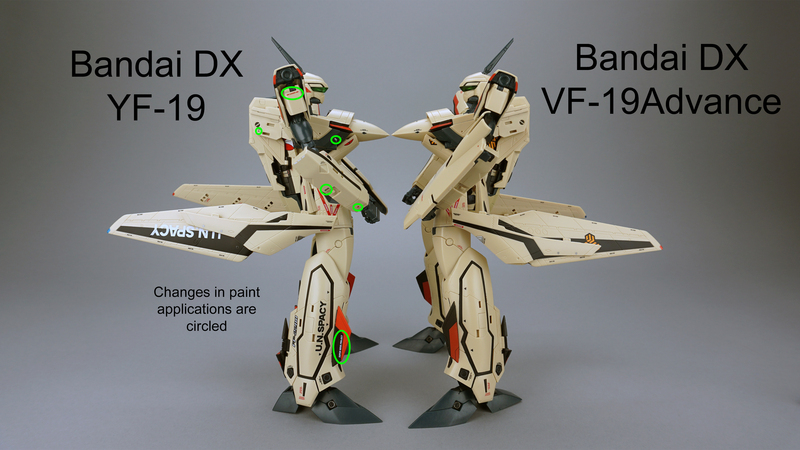 Bandai also altered the display stand to be a bit wider than the VF-19Advance display stand as to not interfere with a fighter-mounted arm cannon. 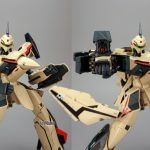 In battroid mode, the arm cannon is pretty cool featuring three opening bays that reveal weaponry in excellent detail. 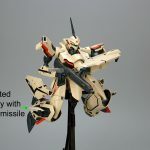 As mentioned above, the VF-19Advance arm does not have the slots to mount the cannon so this weapon is only for use with the DX YF-19. 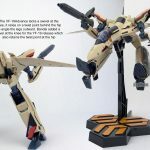 Another feature unique to the YF-19 that was not present in the VF-19Advance is a rotation point at the knee. 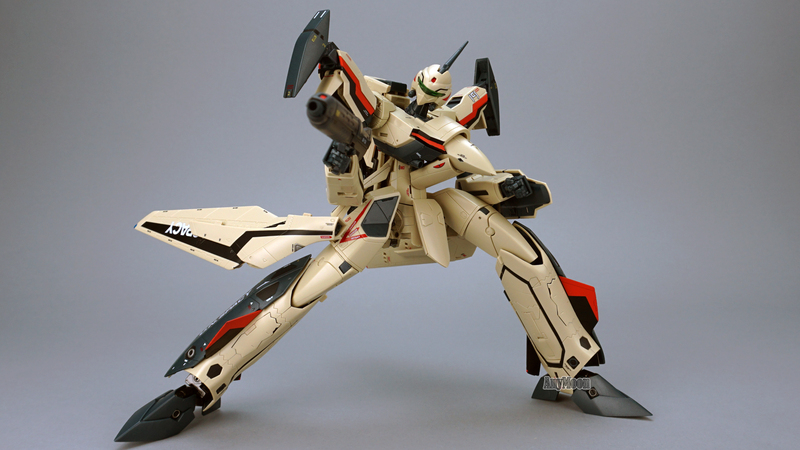 The VF-19Advance introduced the novel approach to GERWALK of having the legs pivot out behind the hips/intakes and it worked pretty well but wasn’t exactly intuitive. 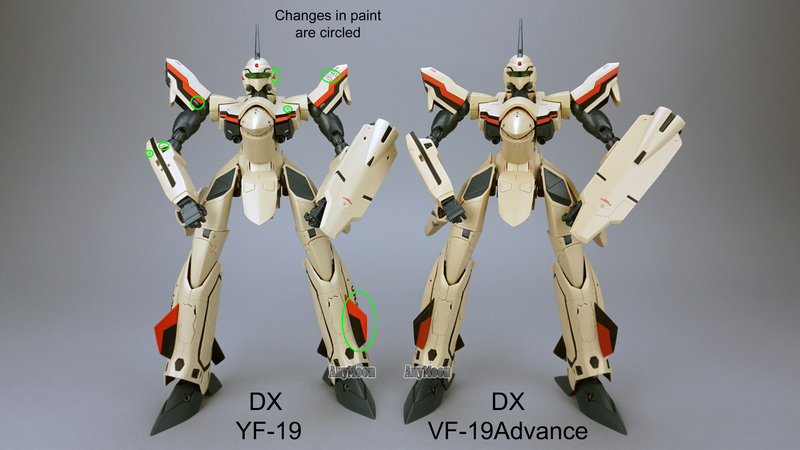 The DX YF-19 has those same pivot points and adds a twist at the knee making it even more fun to handle in both GERWALK and battroid modes. 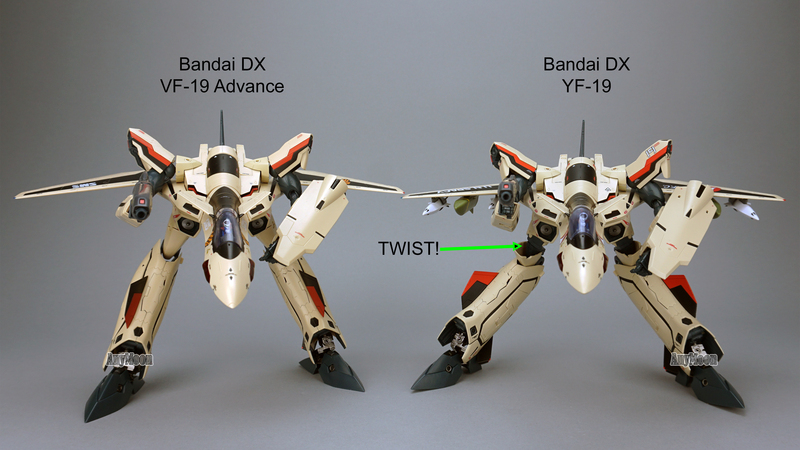 Both the VF-19Advance and YF-19 come with very stiff hips that have led to people breaking them. 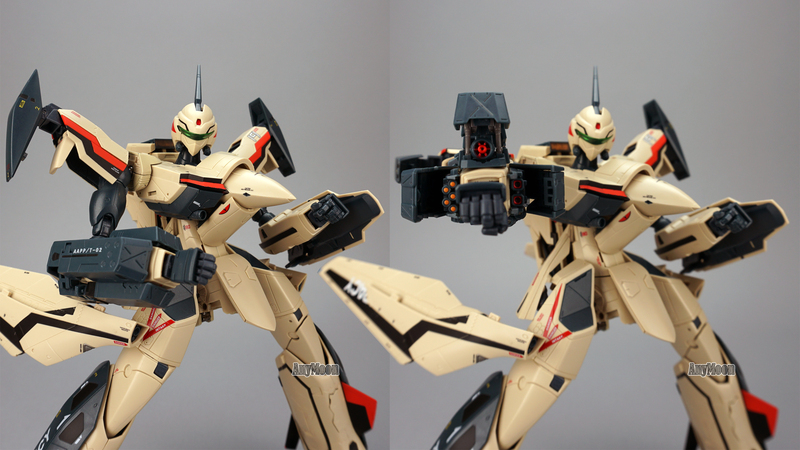 I encourage you during your first transformation to unscrew the two screws on the hip and then remove the housing and loosen the two screws you’ll find underneath it. 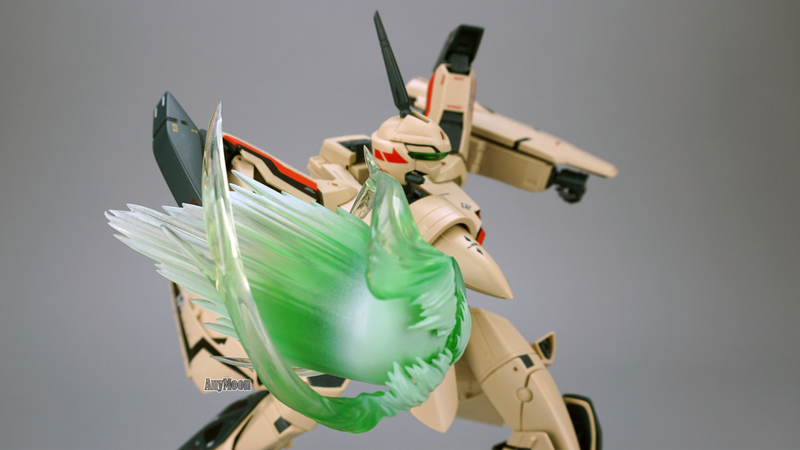 Doing this will make completing transformation easier and make it less likely you’l break your toy’s hip some day. 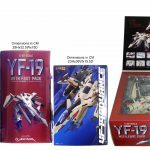 The DX YF-19 comes in a fancier box but it might have come at the expense of effectively safeguarding the toy during delivery. 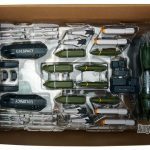 There were numerous reports of head lasers broken off the YF-19 toys before they were removed from the box. 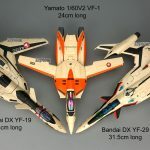 A rampant issue with the DX YF-19 are vertical stabilizers which are far too easily bumped from the toy, including the smaller in-set piece that folds over during transformation. 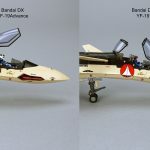 Bandai changed the attachment of the vertical stabilizers from the VF-19Advance and the end result is far less satisfactory. 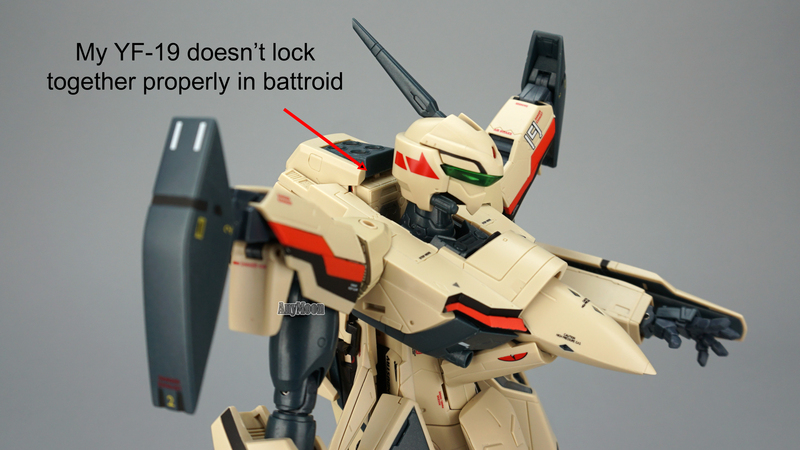 Another complaint that has been popping up with the YF-19, and one I have seen first hand, is an inability to lock the chest area in battroid mode. 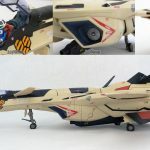 The toy features a door that closes on a peg in front of the cockpit area and something is causing the geometry to be off just enough to create pressure on that connection pushing the door upward. 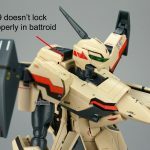 As the door is a secondary lock, it’s not the end of the world, and it may be something that resolves after a few transformations as pieces loosen up… or it might signify some later catastrophic failure so I’ll keep an eye on it. 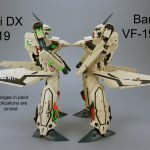 If you know a fix or a description of exactly what is causing the problem, please do leave a comment! 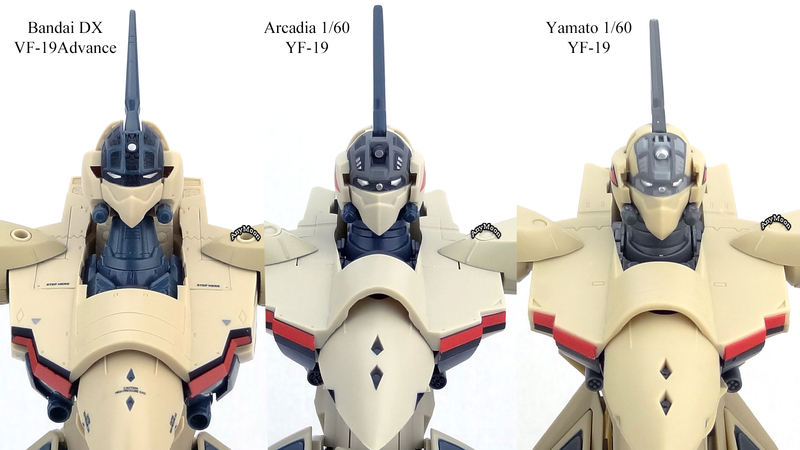 Other manufacturing woes reported far less likely include the standard litany of warped parts, missing parts, and ill-fit but seem to be well within Bandai’s typical levels. 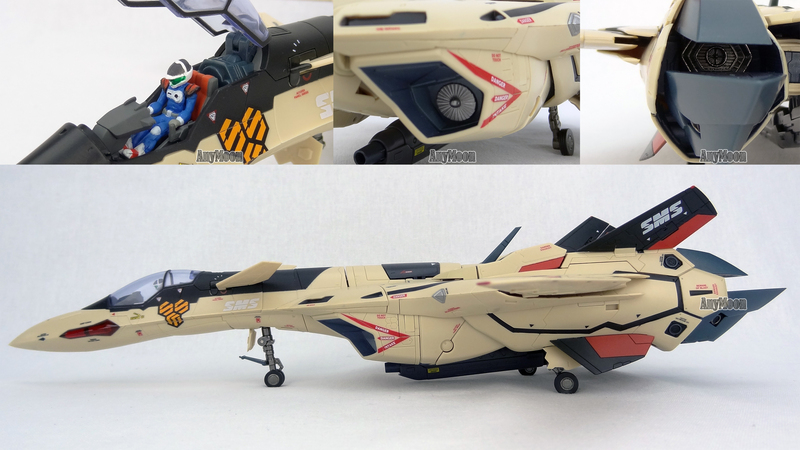 This toy can definitely be frustrating but the fact people find themselves repeatedly transforming it back and forth as they develop a knack for getting things in the right spots and ironing out gaps but aren’t finding they’re breaking anything is a very good sign. 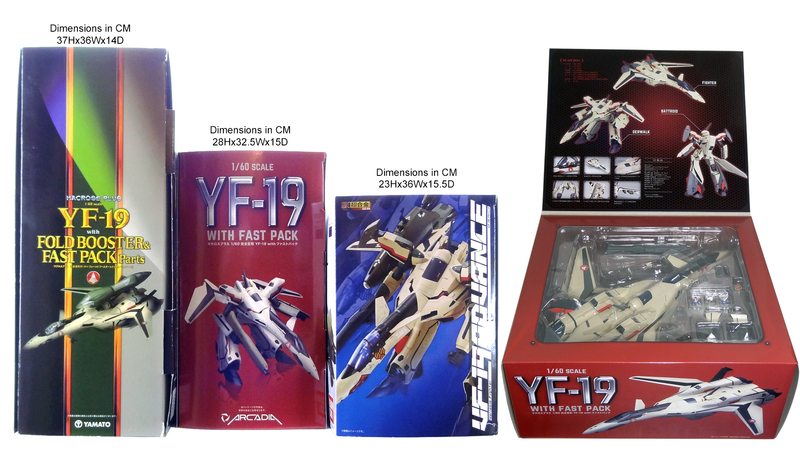 The greatest articulated YF/VF-19 toy has arrived! 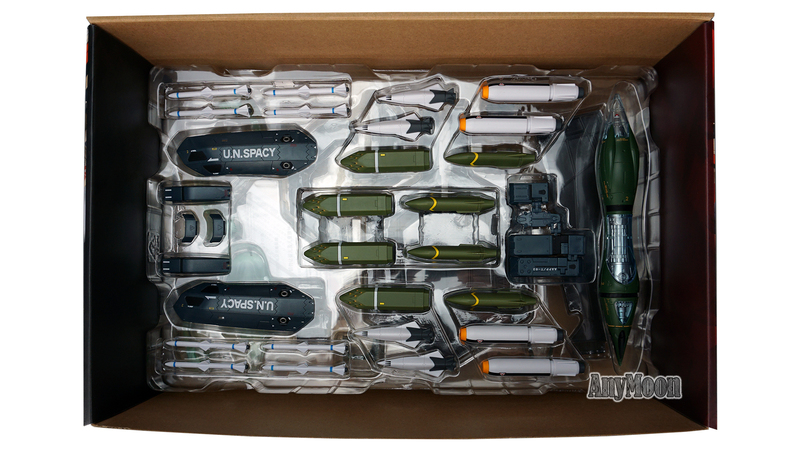 Anything you want! 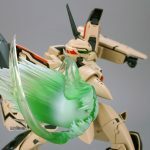 All the candy in the whole wide world is here for you! 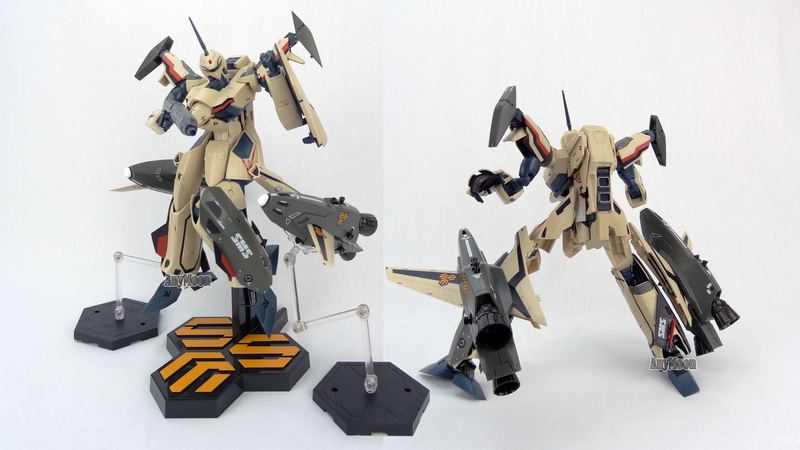 Okay, maybe I’m getting carried away, but it’s really good. 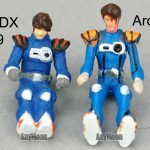 The head is on a ball joint, the elbows have a double hinge, the hips can flair WAY out, the ankles are on ball joints with a great range of motion. 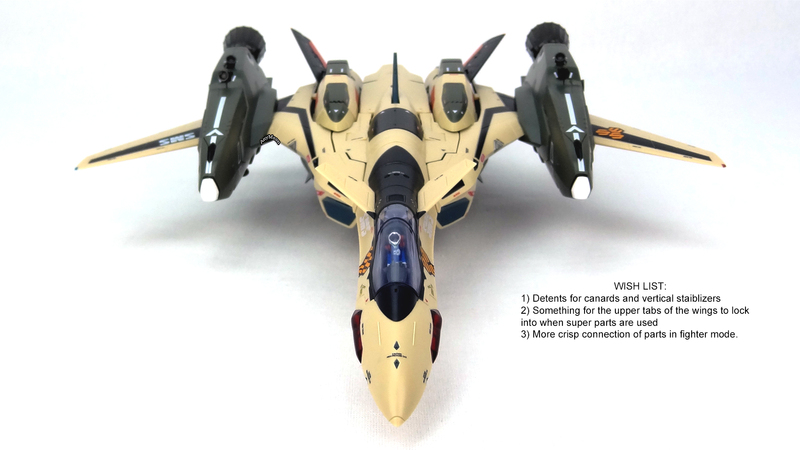 How good is this toy? 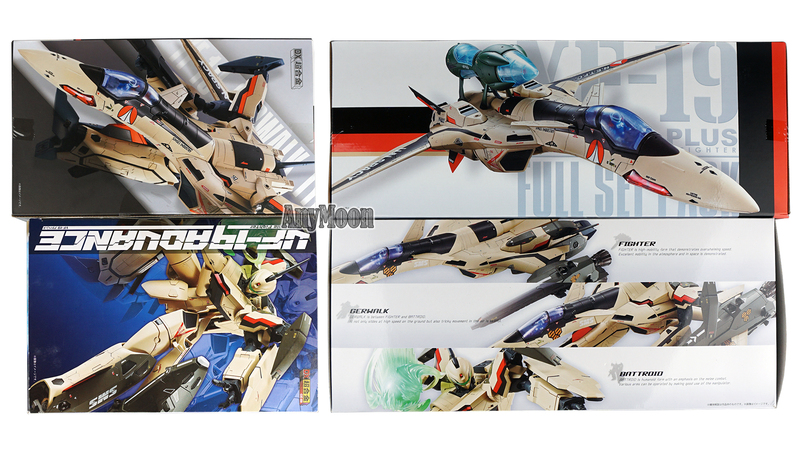 It has a waist (though the range of motion is tiny). 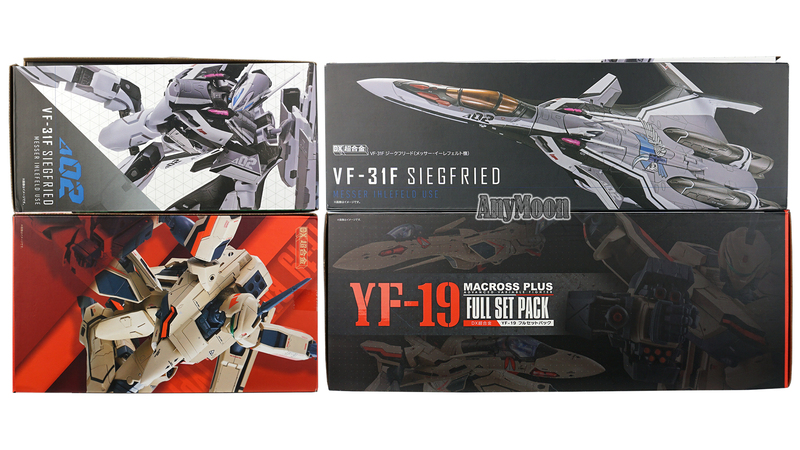 So the question among many has been which to get, the Arcadia YF-19 or a Bandai VF-19Advance or YF-19. 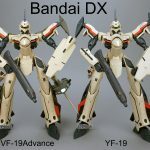 If you’re a huge fan of Advance packs then the answer is obviously the VF-19Advance. 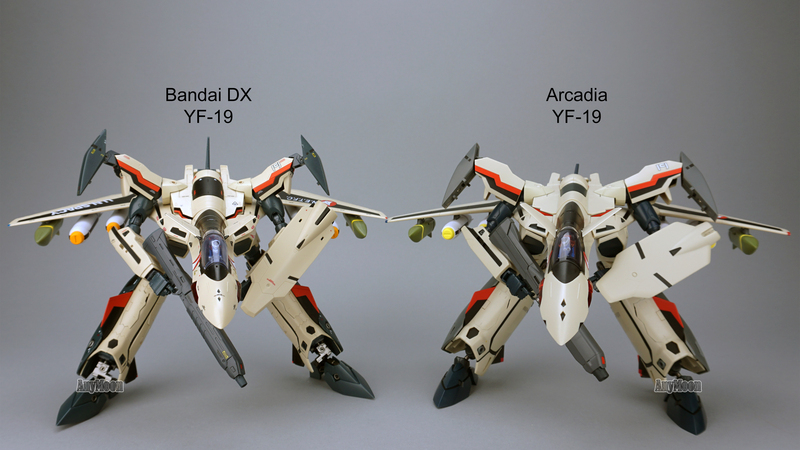 If you’re a fan of the YF-19 with loads of cash, you really should own both an Arcadia and Bandai DX YF-19. 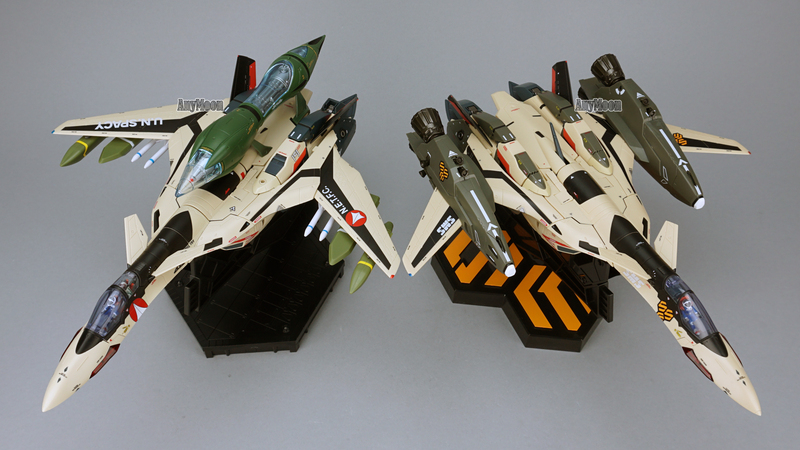 Seriously, they’re both great toys. 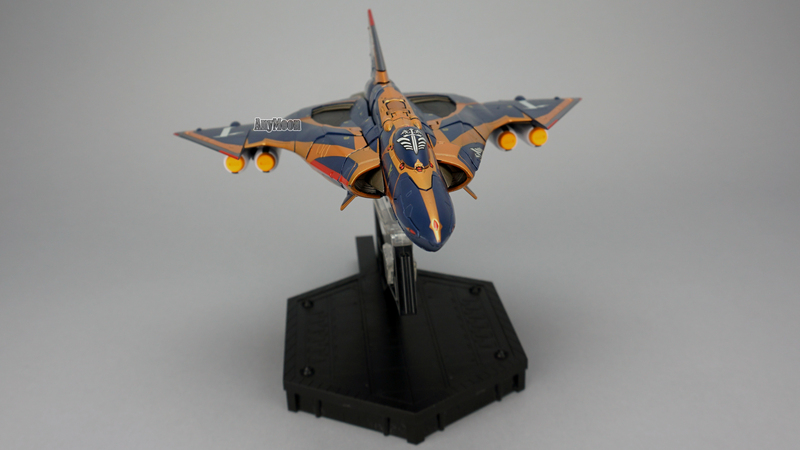 I adore my Arcadia toy but if I had to recommend just one, it’s the Bandai. 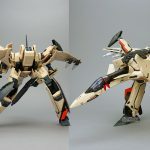 This is primarily a function of Arcadia shooting themselves in the foot with very loose wing and ankle joints that destroy the fun factor and leave you feeling like you overpaid. 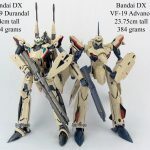 If they were able to do an improved release with tighter joints it would be a tougher decision but, even if they did, the additional accessories on the Bandai offering, all of the painted on detail, and the incredible articulation at a lower price point would be impossible to overcome. 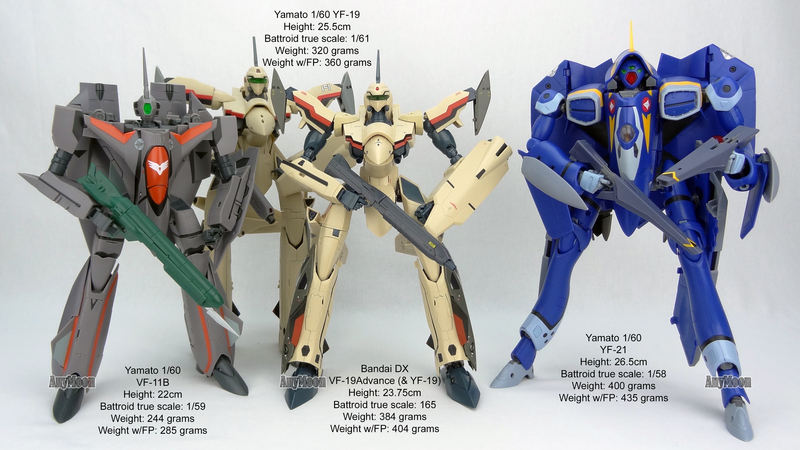 I will provide one caveat here. 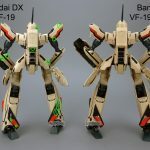 Though the Arcadia toy was very frustrating at times with loose joints and things that fit loosely popping out too often (intake covers, top of the head, back of the gun, canards, wing weapons) I do find it easier to get everything back together properly in fighter mode whereas the Bandai, even after a few transformations, can be difficult. 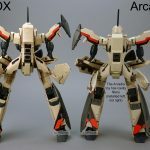 So if you prioritize ease of transformation or a chunkier representation, then you may want to consider the Arcadia toy first. 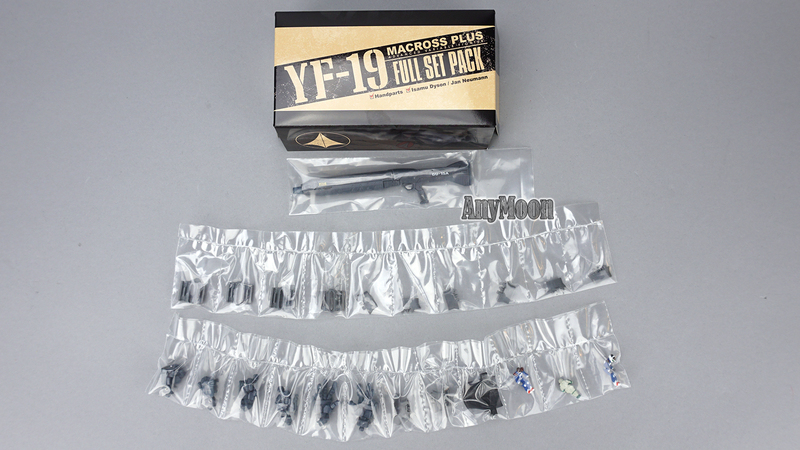 Do you have any information about rumors of YF-19 MAC+ chogokin? 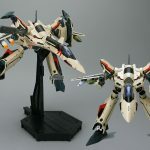 Thanks!! 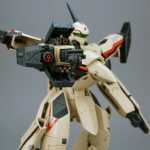 Hi! 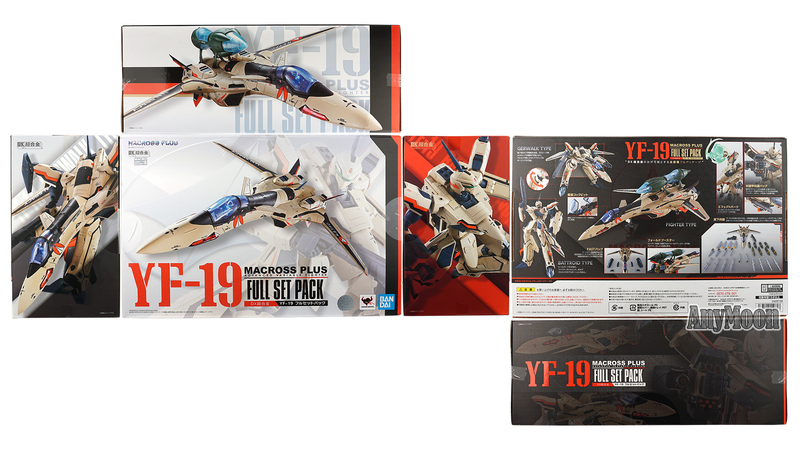 I have wanted a YF19 toy since I first watched Macross Plus in the 90s. 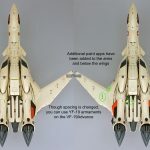 I recently found myself with a bit of money to burn, and searched Ebay for good quality valkyries. 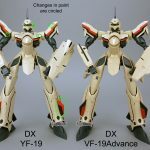 The Bandai VF19 caught my eye, and when I did some research, I found your review on YouTube which convinced me it was worth purchasing. 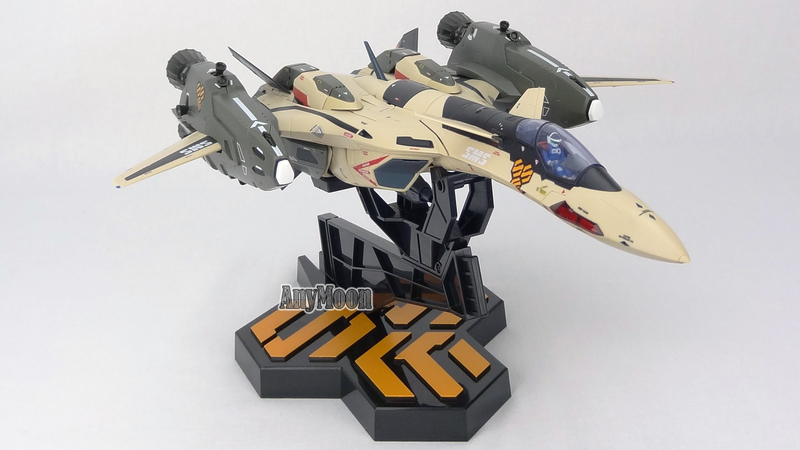 Anyway, I havn’t received it yet, so I’ve yet to discover if it lives up to expectations. 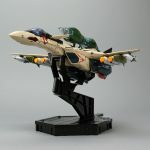 I bought a 1/60 Yamato VF1 (Milia) 10 years ago, and found that to be a very cool piece, so if the Bandai toy is as good, I’ll be happy. 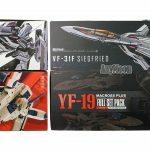 One question; can you advise me on where I could get some bombs/missiles for my VF19? 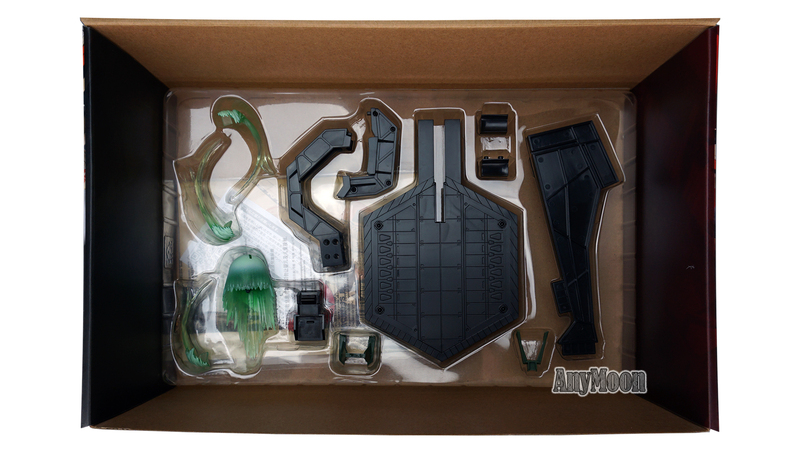 Preferably in the same green colour as the advance parts, but anything that fits would be fine.. 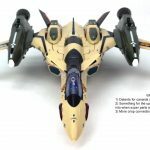 Thanks for the in depth review! 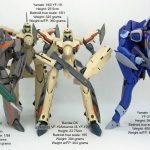 It’s a great question, unfortunately I don’t really have any good answers for you. 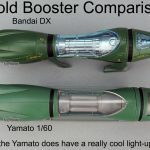 I don’t think any Yamato weapons would come close to working but I certainly haven’t tested them all. 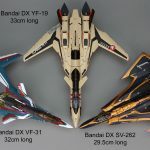 Some of the Frontier DX weapons would probably work but they wouldn’t be close matches visually to what you’re looking for. 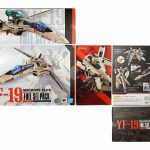 Just got the bandai YF-19 full set and it’s glorious! 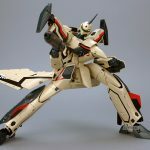 Your transformation video really helps a lot, however can you make a battleroid to gerwalk to fighter mode transformation video tutorial? 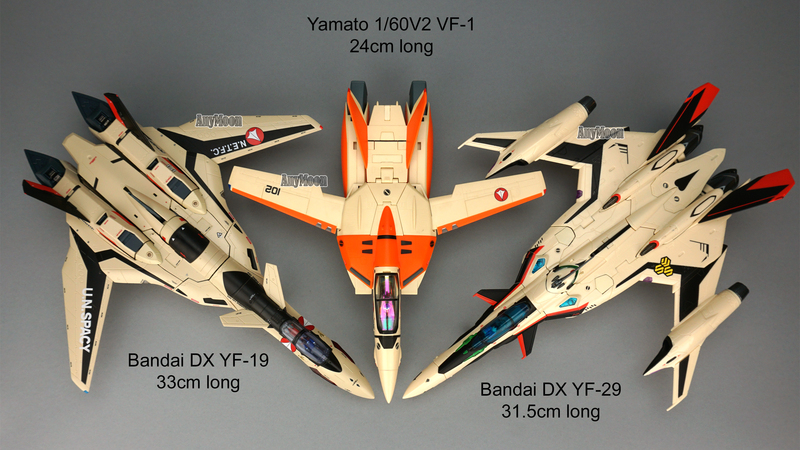 Just like the ones with VF 31. 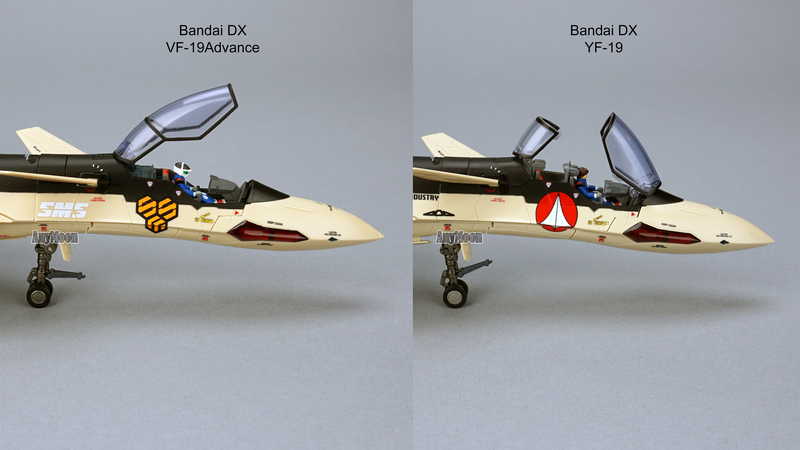 Got the Bandai YF-19 a couple of weeks ago and struggled a bit through transformation. 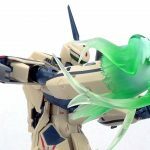 Wish I had your video back then. 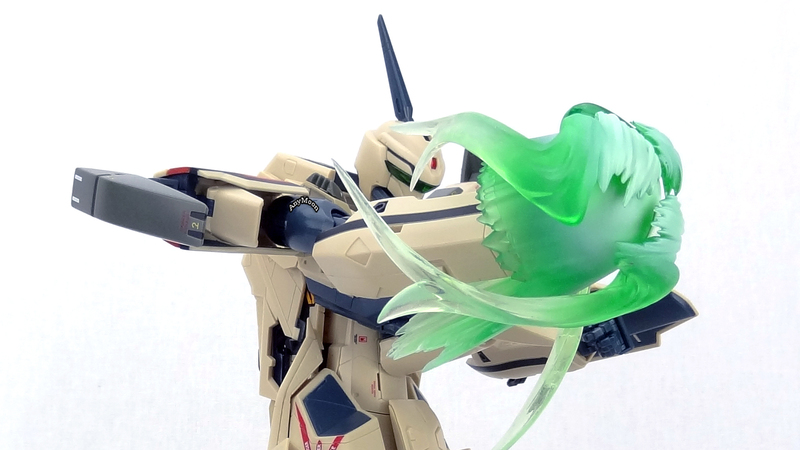 It’s so good! 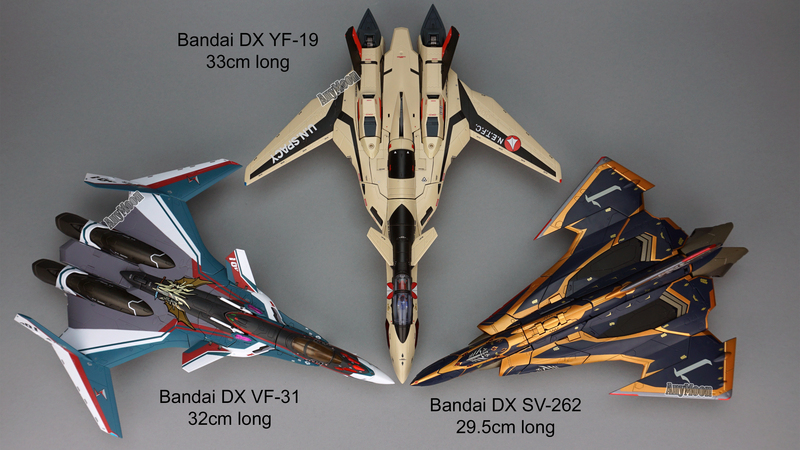 Now if only we could get news on a Bandai YF-21 to go alongside this toy. 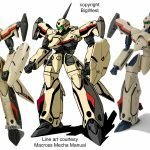 Would be glorious!